Annual reports tend to be self-congratulatory affairs. So let us cut ourselves down to size before we even begin. Last year, DGMT distributed the equivalent of just 0.02% of South Africa’s public expenditure for 2017. That’s tiny in comparison. If we were a species in the animal kingdom and government were a blue whale, we’d be no bigger than an insect! So, if all we have at our disposal is money, we might as well pack it in and go home – or at least claim as our raison d’être the story of the lucky starfish thrown back into the sea while thousands more shriveled on the sand. Fortunately, size isn’t everything. Think of the power of microbes, for good or for ill; or the human eye, where the fovea – a tiny pit constituting one ten-thousandth of the retina – harnesses a full 10% of the processing power of the primary visual cortex to give the clearest vision of all. Think of institutional superstructures that tend to be poorly focused and lethargic, while radical social change often starts as a small movement driven by clear vision and energy. From this perspective, DGMT is quite comfortable owning up to its size – and even embracing an entomological identity as a largish bug! We see DGMT as a light and nimble cross-pollinator, flying just off the ground, attracted by the vibrant blooms of ideas in action, and radiating our own colour. More butterfly than moth. However, these progermination activities are not enough to bring about big change, which is our ultimate goal. We want to develop South Africa’s potential. Funders and foundations run the risk of flitting from one good idea to the next, stimulating innovation but not affecting the social and economic dynamics necessary for large-scale change. Enter the father of chaos theory and meteorologist, Eduardo Lorenz. He coined the phrase ‘the butterfly effect’, whereby small causes can have large effects. He argued that in complex dynamic systems, tiny methodical changes can sometimes have a big impact. He famously concluded that – at least in thought-experiment – the flap of a butterfly’s wings in Brazil could set off a tornado in Texas. First, it seeks to generate large-scale social phenomena that inspire action. At the heart of any social movement are passionate people. A sense of identity, purpose, belonging and possibility in life; these are the levers for mobilising society – and they are embodied in people, not programmes. Hence, we support networks of Activators, Story-Sparkers, SmartStarters and FUNda Leaders, among others, to propel our initiatives for social change. Often, being part of an aspirational brand enhances their public appeal, which is why DGMT likes to pursue ‘social franchising’ as a way of driving demand. Second, DGMT tries to unlock untapped value by finding and releasing pinch-points in the system. These pinchpoints include the administrative sludge of government that chokes the prospects of children and young people, as well as commercial pricing that excludes the poor from opportunity. For example, mobile phones are an amazing platform for information, learning and connection. Yet, up until this year, the high cost of mobile data has excluded those who need this resource the most. We are delighted that two of the four mobile network operators have now committed to zero-rating the mobile services of all public benefit organisations that participate in a registry that DGMT will set up in 2018. The third way that DGMT seeks to achieve the butterfly effect is through ‘amplifier networks’. Our implementing partners – big and small – are themselves splashes of colour and energy that can flow together for greater effect. DGMT’s funding partners are many, reflecting the conviction of a growing number of investors that concerted action is stronger and more durable. The corporate sector is also becoming more active – not just in setting aside funds for social investment, but in using their own business processes to enhance the pivotal projects supported by DGMT. DGMT’s current approach is a stark departure from typical grant-making. No longer do we fund dozens of projects in isolation and plead plaintively for people to work together. Now, we try to weave them together in a bigger strategy. lever for social and economic change. Like our financial investment strategy, we’re less concerned about the ups-and-downs of projects in the short term, and more interested in the power of compounding returns over time – when the effects of all DGMT’s initiatives are superimposed upon each other. financial) returns and embracing failure as evidence of sufficient risk-appetite. Sure, there must be room for great new ideas, but few of them will be outright failures or successes if they are woven into the system from the start. There is little place for binary thinking in a complex ecosystem. Most new ideas only become powerful once they are part of the larger dynamics of society and the economy – and that takes time. The butterfly effect can sometimes achieve largescale change. Sometimes, but not always. The desired outcome is always unpredictable, but is more likely if the butterfly wings keep flapping in a sustained and deliberative way. In the world of public policy, time frames are uncertain and it sometimes feels as if we are flailing haplessly against a closed window. Given the politics of South Africa, 2017 felt a lot like that; 2018 is looking brighter. We will keep flapping our wings, rhythmically and deliberately, until the windows of opportunity open up for children, young people and others who still sense little possibility in their lives. 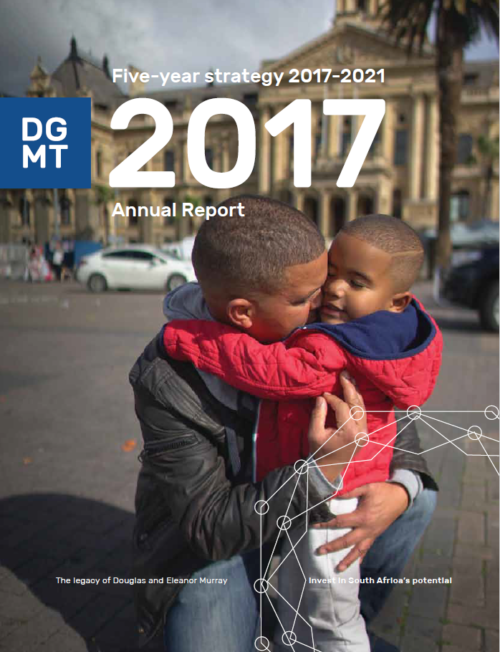 Read DGMT’s Annual Report for 2017 here.